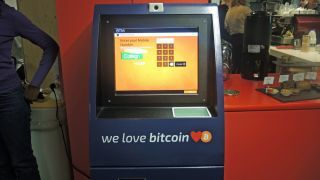 It may feel like the Bitcoin hype has died down a bit recently, but the cryptocurrency is still very much alive, and Google is pledging its allegiance by installing a Bitcoin ATM - sorry, BTM - on its Campus London. The campus's 35,000 members and 100,000 annual visitors will have access to the machine. They'll be able to purchase food and drink with the currency, but more importantly, Google wants to inspire its tech entrepeneurs to experiment with the virtual currency and build ideas around it. The machine arrives thanks to a collaborative effort between Google, Bitbuddy and Callsign (which users can use to verify their account via smartphone when using the machine). We had a play with the machine ourselves, and saw how quick it was to deposit cash into your Bitcoin account. It only accepts notes, unfortunately, and of course you'll need a Bitcoin wallet somewhere for the money to travel to. But it's interesting to see Google backing Bitcoin with this gesture. There are still a lot of questions over the currency regarding security and volatility, but day by day it's gathering support. There are only six "BTM" machines in the UK right now, but it's not crazy to think that we might see a lot more in the near future.